This presentation stein has a cylindrical upper portion over a flared section which rises from a pedestal base. The German hallmarks indicate it is made in .925 sterling silver rather than the typical German standard of .800 or .875 silver. The body is beautifully decorated with repousse and chasing and is partially highlighted with a gold wash. This silver work surrounds 26 inset silver and four gold coins. There are primarily the silver German Mark coins in denominations 5 to 20 Marks from the years 1872 to 1889. There are also Austrian Thalers and commemorative silver coins with dates ranging from 1845 to 1889. The lowest flange of the pedestal is engraved in beautiful German script which roughly translates “To the President from 1872-1889 from the members of the Royal Scientific Deputation of the Medical Society of Prussia 1889.” This German Society was considered the most important department of government at the time. The head of this section of the government or President was in charge of educating all military, government, law enforcement, and health officials concerning how to stem epidemics at the earliest possible time. At this time in history epidemics caused far more deaths than wars, so stopping them was paramount to the government and the people. The handle of the stein is highlighted with gold plating and decorated with an applied snake that winds three times around the handle. The finial of the large lid is another smaller snake drinking from a footed cup. The symbolism is that the physician can cure the bite of even the most venomous snake. The stein’s interior is heavily gold plated. This piece contains 67 ounces of gold and silver and was made in Berlin (possibly by H. Meyen & Co.) in 1889 which was shortly after all medical, health and safety personnel had been trained by this department to reduce the number and severity of epidemics of cholera. 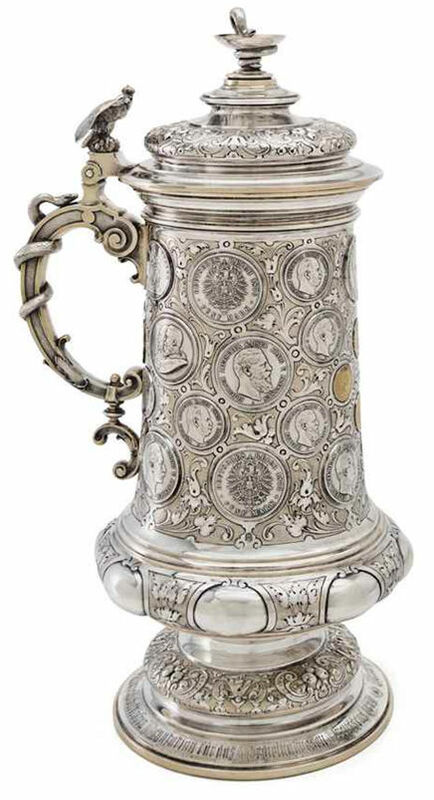 The President was obviously a man held in high regard by this extremely crucial organization as the gold crowned eagle indicates that this particular stein was awarded by his immediate ‘supervisor,’ the Kaiser on behalf of all the grateful people he had taught.